My life has been SO, SO, SO, SO hectic over the past few weeks, so let’s start this post on a positive note: I’ve lost 4ish pounds since I started tracking again two weeks ago, via Weight Watchers! Either that, or my mom’s scale is way off (but she swears up and down it is accurate). This is basically because I’ve A) been tracking (duh), and B) stopped eating fast food! Considering one fast food meal can average about 30+ points, it can DOES add up. In other news, Happy (belated) Halloween! I hope everyone enjoyed themselves, whether at a party, home, or out trick-or-treating with your families! We stayed home in order to cook dinner, pass out candy to little ones, and show off our dog in his super sweet costume (hopefully you saw the picture in yesterday’s post). Oh, and we bought a new rat cage yesterday (yes, we have two pet rats), so we assembled that last night, as well. So, onward to this pulled pork recipe, which is actually related to the first paragraph about WW…yes, I get off track sometimes, but I usually end up finding my way back! 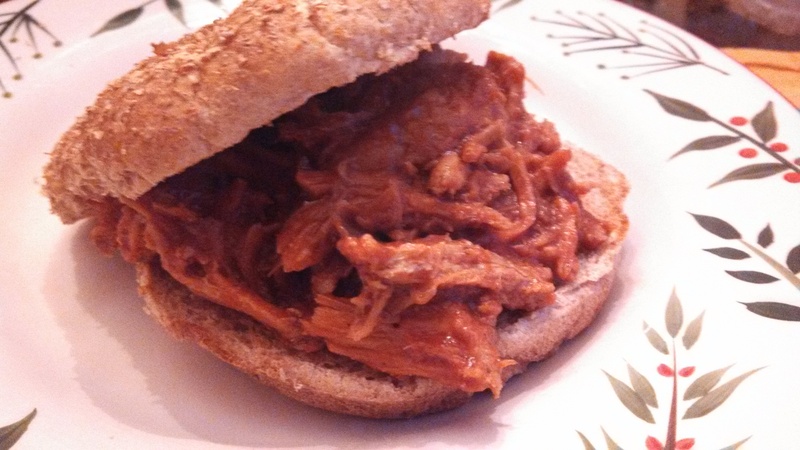 This is a pretty simple pulled pork recipe from Skinnytaste. Her food blog was originally shared with me by my friend ALYSHA. Alysha’s also guest-posted a yummy dessert recipe, which you should all check out! 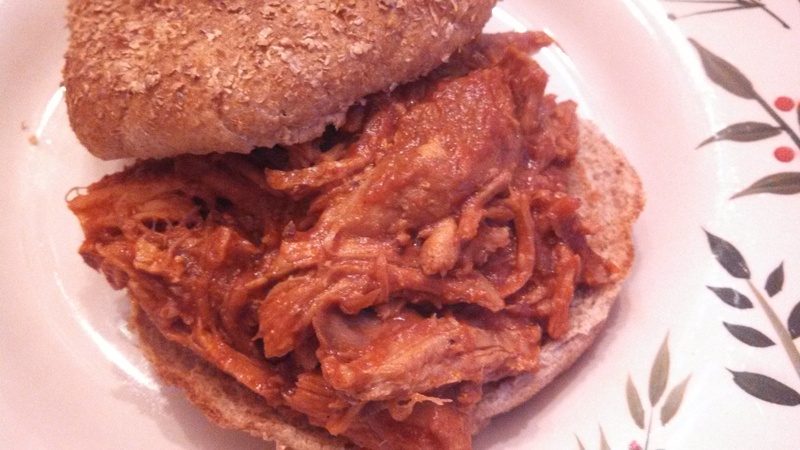 Who knew that barbecue pulled pork could be WW-friendly? Certainly not me. That reminds me, I have a WW-friendly tater tot casserole recipe that I’ve been itching to try. 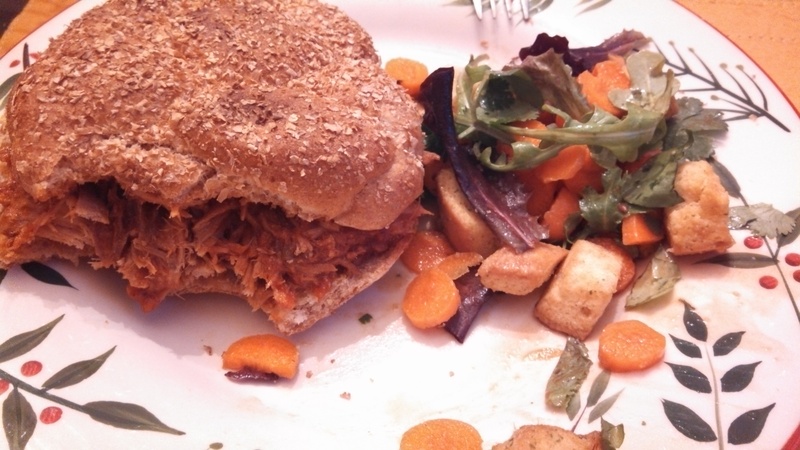 This pork, from Skinnytaste, involved a homemade Kansas City-style barbecue sauce, which you can also find from Skinnytaste’s website (or, to save time, use your own favourite barbecue sauce, like Sweet Baby Ray’s!). I had everything except molasses on hand, so I substituted some of my husband’s beloved Vermont maple syrup, and it still turned out pretty well. The ingredients calling for the really small measurements, I ended up just sprinkling in, so I may not have been *completely* accurate. It was pretty sweet, at times, and then had a smoky/spicy aftertaste, which was a great flavour combo! This created dinner for the 3 of us, plus 3 days of leftovers for me to take to work! Since there is so little liquid in the crock (which also depends on the size of your crock), it will look like it’s burning on the sides, but trust me, it comes off with some scrubbing). Recipes calling for less liquid are typically trying to be healthier, which makes sense, given this is a WW recipe. Also because there is so little liquid, make sure you stir well, so that the spices don’t burn onto the top of the pork, without getting immersed and stirred into the liquid portion. It didn’t pull easily AT ALL, though was cooked through, and not overcooked. I think this is because, noting above, it has so little liquid. Normally if it marinates in more liquid, it will be more tender. But once it did shred, it was perfect. Just required some extra lovin’. -Place pork in the slow cooker and season with salt, vinegar, garlic powder, and liquid smoke (mix/stir well). -Cover and cook on high for 6 hours. 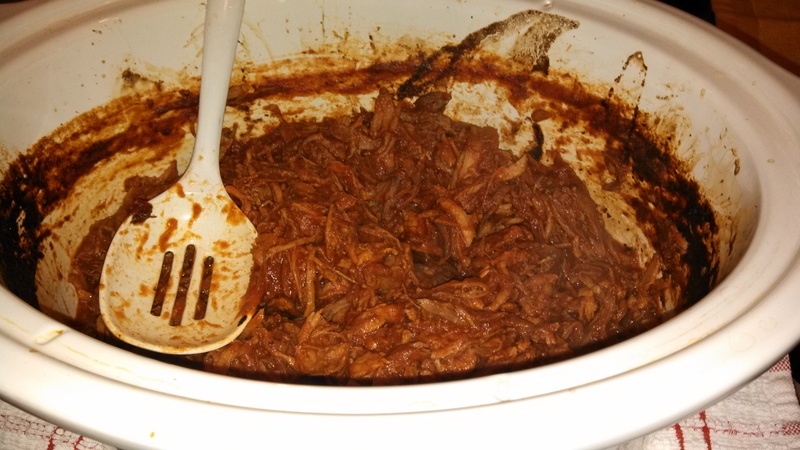 -Shred pork in the crock, then add the barbecue sauce and stir. -Cover and cook for another hour (I only did for 30mins, and that was fine). -In a large saucepan, combine all ingredients, and simmer on low heat for about 25 minutes, stirring occasionally. -Let it cool and store in the fridge until ready to use.